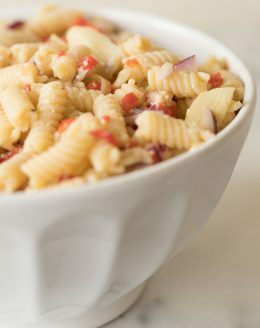 Easy Italian Pasta Salad Recipe - the perfect summer side dish that takes very little time and effort and is light and refreshing! Bring a pot of salted water to a boil and prepare noodles according to instructions. Drain and set aside. Combine olive oil, red wine vinegar, salt and pepper. Set aside. In a large bowl, combine noodles, artichoke hearts, red onion, pimentos and dressing. Toss with parmesan. You can mix this easy Italian Pasta Salad recipe up by adding your favorite ingredients or choosing your favorite shape of noodle.